Peter is a probationary police officer in the MET – just about to get his first real position. And it doesn’t look good – he’s a bit too easily distracted, doesn’t have much concentration and maybe not best fit for the job; a fine future of office work awaits him. At least until he meets Chief Inspector – he’s the MET’s wizard. And, after taking a witness statement from a ghost, it seems that Peter is perfectly placed to join that very unique police department. It’s not the most conventional department – especially since he and Nightingale make up its entirety, along with a completely unknown non-human servant Molly (and a large library full of extremely old books). In addition to learning how to become a wizard, he’s also tasked with brokering a peace deal between Mama Thames and Old Father Thames – deities in all but name. But the primary task is a series of horrendous and apparently random murders leaving people with their faces apparently falling off. 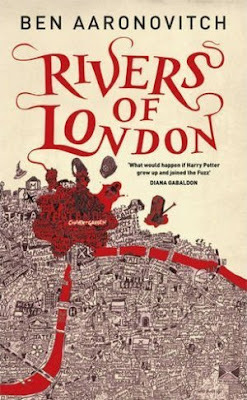 The investigation of random culprits, ghosts, a couple of vampires, magic, gods of the London rivers and a rampaging Punch and Judy Show. It seems so random – but it all comes together excellently. Sometimes I pick up a book set in Britain and I can tell it’s written by an American (anachronistic profanity and a heroin-like addiction to tea are normally involved), sometimes I’m not sure – and sometimes I know beyond a shadow of a doubt there is no way anyone but a British person could have written a book. And this was most certainly one of those. Within seconds of opening the book I could feel the Britishness wafting off every page. There is a brilliant sense of time and place – this is London, you can feel London on every page. This is London as can only be written by a Londoner. In short, the setting is really well done with a full sense of history and local knowledge. The writing style is wordy – but concise, the descriptions giving an excellent feel of time and place and making the scene excellently real. Normally I am put off by too much description but this book hit the balance of making sure the whole scene was conveyed while not losing us in dense verbiage. And that same level of detail applies throughout the book – not just the place settings. The author either has a background in policing or has gone to far more research than most. The book has the police procedure down perfectly. There’s no magical CSI (well, except actual magic) no random police units that don’t exist, no fudging of the issues and the procedures – it’s accurate. The magical world setting is also excellent. I wonder how big the author’s world building notes are because it feels extremely planned. It’s consistent, we have a full, internally workable system for the magic (not just words and lights) – it feels planned, it feels workable and it adds a level of realism that all of these creatures and beings and magic work together in an overall logical and thought out system. It’s almost a scientific take to magic. It shows a lot of work a lot of dedication and it makes the story work more because it works within itself – and magic has rules so doesn’t just Deux ex Machinae everything. And it’s funny. Laugh out loud, hilariously funny. And it’s dry – with a rueful observation about so much of policing, society, the city, the Daily Mail, all presented in a subtle, slightly cutting and witty smile that kept a smile on my face throughout the book. It’s also inclusive. The protagonist is a mixed race man and many of the side-characters are POC as well. Not only POC but they are POC that both lack stereotypes and carry a full sense of their own culture. Peter doesn’t just avoid being a stereotypical black man, but he also carries his culture with him – from his parents cooking to his family – his race isn’t just a descriptor that’s included in the beginning then forgotten and the same applies to Beverly Brook, she’s more than just a racial descriptor. And I absolutely loved that Mama Thames (feuding with Old Father Thames) is a Nigerian woman. Who is awesome. In fact, in every scene we are reminded that London is a multi-cultural, worldwide city, there is a global feel that London has – too many books show London made up of a universal white, British population when it so clearly isn’t true. While the story focuses on Peter and Nightingale, there are also some very strong female characters who make their own decision and are extremely capable. Beverly Brook makes her own way, Lady Tyburn has power influence and definitely her own will – and Mama Thames rules her kingdom, no ifs buts or maybes. Even if she can be bribed with the good booze. There are only a couple of minor GBLT characters and they seem to be assumed as much as anything (and one dies) but any clichés associated with them are directly rejected as clichés. Ok all of that probably sounds a little preachy – it isn’t. All of this fits seamlessly into the plot – it’s one of those books that can fit in important messages and context without preaching, without rambling round the point – but by including concise, on the spot references that flow directly from their daily lives. Criticisms? Hmmm. Well. Hmmm. Nah, I got nothing, I loved it – any criticism would be a desperate attempt to nit pick for the sake of having some negatives to include. The closest I can get is there’s one point in the story where I’m not sure how we jumped from A to B – it didn’t break the story but there did appear to be a leap I didn’t quite follow. If you aren’t British it is possible some of the humour and culture may drift over your head (I’m told that Punch and Judy is not a concept that has spread that far?) – but most of it is excellently explained and contained within the book and there’s no way this should be hard to read for a non-British person. If you are British – well it’s a gem, an extra gem of understanding and context which will turn an already supremely excellent book to one of the best you’ve ever read. Go out, buy this book, buy a second copy for your friends and be as eager as I am to learn that it’s just the beginning of a series – I can’t wait to read the rest and it’s an effort of will that has me not reaching for the second book right away. We were provided a copy of this book for review by the author. Teen Wolf Season 2 The first 10 minutes!